ezCardTrick from Hyunki Hong wants to turn everyone into a magician. With the wave of your hand, and a little inside information, you too can be the next David Copperfield. Well, sort of. 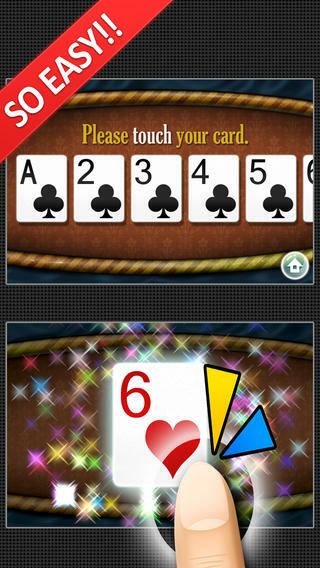 If you use this app you can know the card secretly without seeing screen. This app can make you the life of the party! You don’t need much training time. When you want to make a move a person use this app. you can see the movie clip here. When you open ezCardTrick the main screen features the word “Play”. Have your friend select a card, then you magically guess it. The secret to the trick is this: once your friend has made their suit and card selection, the flash is programmed to blink in a Morse code fashion to let you, the magician, know what card they picked. Each card is assigned a number of flashes to signal the appropriate card. To hide this from your audience you will need to keep your finger over the very bright flash. The most difficult part here is having to memorize each and every flash sequence for each card. If you don’t, this trick just can’t be done. This kind of takes the “ez” out of the name. Along side of that, it is very tricky to hide that bright flash. The video demonstration on their YouTube channel shows it can be done, but it just seemed too noticeable. It isn’t a big wow of a trick either, to be honest for a paid app, I was expecting more. ezCardTrick is not exactly easy, but it’s not a bad trick. With a little work, you could definitely pull it off, I’m just not sure you want to. It’s available now in the App Store for $0.99.